Sony has officially lifted the lid off the PS4 during its New York City event today, showing that it wasn't just gathering journos, developers, and the watching world for the biggest practical joke ever. The console, which Sony didn't show once during the 2-hour gathering, should arrive by holiday time 2013. Pricing, as you may have surmised, wasn't announced at all. The PlayStation 4 marks the first major system introduction from the Japan-based company since the PS3. 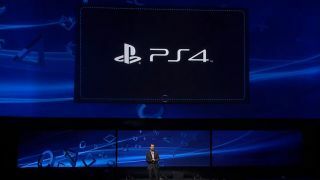 Minutes after the event got underway, Sony's Andrew House announced what we expected all along, while Mark Cerny, lead system architect, zipped through the console's specs, so fast the hardware needed a post-event press release to crystallize. While the actual name dropping of the new console took but a few seconds, Sony and an ample helping of game developers walked the audience through a host of launch titles, many of which, interestingly enough, will also make it onto the PS3. Let's take a look at the insides: The console owns an eight core, x86-64 AMD Jaguar CPU. It houses 8GB of GDDR5 unified high-speed memory, and a "highly advanced" PC GPU with "remarkable longterm potential." That processor, also made by AMD and referred to as a "next-generation Radeon based graphics engine" in the press release, boasts 18 compute units that together produce 1.84 TFLOPS of processing power. We'll also see Blu-ray and DVD support in the PS4, along with HDMI, Analog-AV, and optical digital output. Sony has inserted a secondary chip completely dedicated to uploading and downloading titles, regardless of whether the system is on or off. As for functions, there is a welcome suspend and resume feature accessible thanks to a press of the power button, eliminating boot time lag. Users can download or upload games in the background, which is helpful enough, but Sony decided to take it a step by allowing users to play games while the rest of the title loads. As for the camera, the Kinect-inspired PlayStation 4 Eye contains two cameras with wide-angle lenses, picking up an 85-degree diagonal view. The 1280 x 800 pixel cameras, we're told, can cut out users' images from the background as well as recognize which player is in front and who is behind. Though we'd like to see it in use for ourselves, Sony said users will be able to log into their consoles using facial recognition while voices and movements can interact with games "more intuitively." We've also been introduced to the all-new DualShock 4, a touchpad-packing controller especially designed for the new system. Sony said the PS4 Eye can sense the color of the controller's light bar to judge where multiple players are in a room, replicating them on the screen after sensing their location. Unfortunately it may be many months before we get to actually put these specs and features to good use, and plenty could change before the final product is unveiled, but Sony has given us something to look forward to.